You are here: Home / faith / How is God at Work in Your Life? I’ve been working through Experiencing God (again), and I find myself pondering Reality One: God is Always at Work Around You. The same God Christ knew as His Father, is our Heavenly Father today. God was working before He sent Christ to the world. He was working while Christ was in the world. And He continues to work through His Spirit today. I love how Moses’ story ties into this. God heard the cries of the Israelites and He desired their freedom, so God invited Moses to join Him. It really didn’t matter what Moses thought the plan for his life was. What mattered most was God’s plan for Moses’ life. Many Christians today have a preoccupation with knowing God’s will for our lives. I know I’ve struggled with this before … and I’m still struggling. There are some areas where it is very evident that God has at work (like with my family and with writing), but there are other areas where it appears God is silent. The thing it helps me to remember is that God’s focus has always been on getting His people to come into line with His will and with what is on His heart, so that we (I) can adjust our lives (my life) to Him, rather than having God design His plans around us (me). And what is God’s plan? God is and always has been actively drawing people to Himself. This also means that I do not have to come up with plans for God, or design ways to achieve kingdom goals. God is at work, and when I join Him in His activity, I am in perfect alignment. When we seek God’s will, He reveals to us what He is doing. When we see His activity, we can then invest our time and energy in His work and not waste time and energy on our plans for God. Think about the people in your life. Remember that God has been at work in each of their lives since their births (and before!). Your role is not to do the Spirit’s work but to recognize where the Spirit is working in other’s lives, and to join Him. 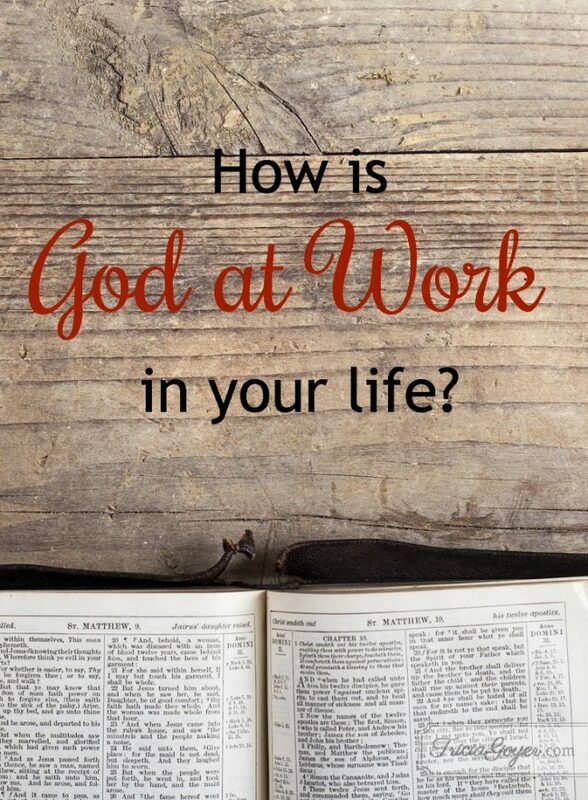 Where do you see God at work around you? How does He want you to join Him? I agree that we align what God has for us. Not the other way around! We need to be instant in prayer. He will answer! I lost a crown on Thursday and emailed my Christian sisters for advice and prayer. My pastor’s wife suggested their dentist. Because of the holiday I couldn’t call til this morning. I got an appointment today at 1:00 p.m. My tooth is back together and cost less than I expected. To God be the Glory! He is even in charge of the ” little ” things. Yes, I love how He’s in charge of the little things, too! I know God wants to work in my life but I am not allowing him to by continuing to be in a relationship that he does not want me to be in. I am in need of prayer to end a 3 year relationship with my boyfriend Cody. I know God wants to me end this relationship because it is not his desire for me to be with this person. I have tried to end this relationship before, yet I find in some way or another I am still in this relationship. Please also pray for Cody to grow with his relationship with Jesus as well. He tells me he believes in Jesus as his savior, but his life is not reflection of that. I know he needs a lot of healing and forgiveness in his own life and I pray he finds that. Please pray that I can find the strength and courage to move on from this relationship and allow God to work in my life! Thank you!